The Presidency on Wednesday explained that like a good wine, President Muhammadu Buhari who will clock 73 in December gets better with age. Special Adviser to the President on Media and Publicity, Mr. Femi Adesina, stated this in a press release made available to journalists in Abuja. He was reacting to a statement credited to Buhari during an audience he granted Nigerians resident in South Africa that his age would limit his performance as the President of the country. Although he admitted that the President made the statement, Adesina said it was not an admission that Buhari was too old to cope with the demands of his office. He said the President currently in the saddle is like an old wine that has got tastier. 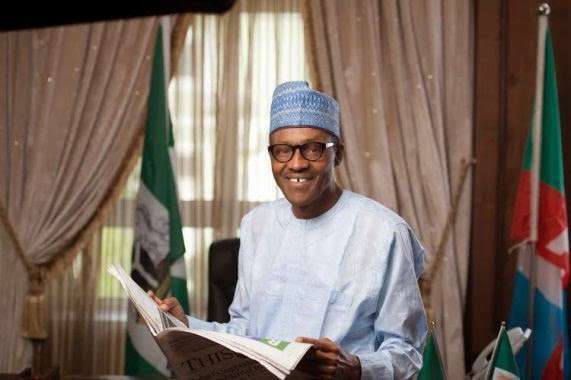 The presidential spokesman said although at 72, Buhari could not be called a youth, but he has in quantum the wisdom, patience, temperance and forbearance that age brings. He said he had brought all these virtues to the Presidency to make a difference in national life. “The above comments have been reported by some newspapers to mean that the President was saying he was too old to cope with the demands of his office. Far from it. “As the saying goes, ‘old wines are tasty’ and the President Buhari we have today is a man, like old wine, that has got tastier. “At 72, yes, he can’t be called a youth, but he has in quantum the wisdom, the patience, temperance and forbearance that age brings. And all these virtues he has brought to the Presidency, to make a difference in our national life. “The President assured the Nigerian community in South Africa that his administration will make a positive impact on the country. And that he would do. “Insecurity as symbolised by insurgency will be brought to an end, corruption will be fought to a standstill, employment will be created for the teeming army of unemployed, the economy will be revived, and the quality of life of Nigerians will take an upward swing again. Adesina added that at 72, the Buhari persona has not changed. He added that because Nigerians earnestly desired change, that was why they voted for him overwhelmingly at the general elections in March. He said all the virtues and values of the Buhari persona would be deployed into governance in the weeks and months ahead. Adesina recalled that the Nigerian community in South Africa was enthralled as Buhari spoke with them on Monday. He said leaving the venue was an effort, as they swarmed round the President, who shook hands with as many of them as he could. “They took his message well. That is the essence of good wine. It gets better with age. And it is a message for all Nigerians, both at home and in the Diaspora,” he concluded.